McDonald's has a special place in the hearts of children. The company has a widely recognized primary mascot -Ronald McDonald. He's a clown, loosely modeled after the popular Bozo the Clown (and from the same era of the 1960s). You may not know it but Willard Scott who played Bozo was also the original Ronald McDonald. Over the past 52Ys, there have only been 8 people who have portrayed Ronald and as one of the Ronalds quipped, more men have walked on the moon than portrayed Ronald McDonald. One important question about Ronald is in regards to his enormous red shoes and exactly how large they are. This appears to be something of a corporate secret, as no one is saying and there seems to be some disparity in historical photos. 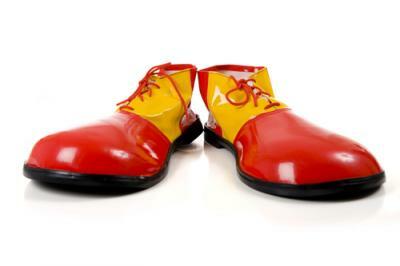 While most bank employees we know don't normally wear clown shoes, in some banks loan pricing can be as much a mystery as the actual size of Ronald's shoes. Some banks primarily follow the competition in pricing loans, using a reactive strategy. Unfortunately, this approach can result in lower asset yields over time, is based heavily on anecdotal information in many cases and may be risky to execute. Given bankers operate in a competitive world, one may wonder what alternatives there are. After all, loan pricing is a tricky business, is based on imperfect information and has many factors to consider. In determining the right rate to offer a potential customer, banks should begin by at least analyzing the loan's expected loss, optionality, interest rate risk, amortization and cost of originating and servicing. This should also be done with Basel III capital requirements in mind. There is plenty of complication using these metrics as a starting point. One simple factor that is often overlooked when pricing loans though is the size of the loan - it is a significant factor in the profitability (or lack thereof) of a loan. For instance, assume two loans are identical in rate, terms and type. The only difference is that one is for $200K and the other $400K. Assuming current and projected future interest rates, the larger loan (based on our loan pricing model) is going to be 250% more profitable than the smaller, despite only being twice the size. Why? The answer is that it doesn't cost the bank twice as much to originate and service the larger loan. Unfortunately, loan size is one of the most overlooked factors in pricing, as banks seek to capture customers. Too often, loan officers find themselves spending a significant amount of time booking smaller deals, with the bank not being adequately compensated for the additional effort required. PCBB research looked at a group of banks and found that on average, 80% of C&I loans had outstanding balances less than $150K. The pricing on those loans averaged 5.60%. On the positive side, this pricing was slightly higher than larger loans. Loans with balances ranging from $500K to $1mm had an average rate of 5.00%. However, the higher pricing on the smaller loans simply wasn't enough to compensate. Consider that in order to generate an equivalent return, the pricing on the smaller loans should have been at a rate around 6.70%. Here's what we suggest. Compensate yourself for the smaller loans but don't beat yourself up if the customer doesn't take the deal. Unless this customer has other significant banking relationships (or the potential for significant relationships), then the impact to the bank is nominal. If the customer has significant other relationships, that can make the overall relationship successful and also allows the bank to offer a more attractive rate. Finally, if your bank is not hitting its total loan targets, consider loan participations as a means to supplement internal loan growth. In the end, banks should have a good idea of how much higher the rate should be for smaller credits in order to make up for the increased costs of customer acquisition. Unlike those big red shoes, the size of a profitable loan shouldn't be a mystery. Treasury yields dropped 7 to 9bps as the Labor Dept reported the smallest gain in wages in more than 30 years. Reports on personal income, spending, and vehicle sales. The IMF is suggesting regulators set specific capital limits against a change in interest rates as inherent exposure is running high and smaller community banks have built up concentrations. Regulatory analysis finds the percent of banks (failure rate) by construction and land development exposure to total risk based capital was about 47% if over 400%; 22% if between 300% to 400%; was about 8% if between 200% to 300% and was about 5% if between 100%and 200% (it was 0.5% when between 0% to 100%). Regulatory analysis finds the percent of banks (failure rate) by total CRE exposure to total risk based capital was about 42% when over 700%; was about 30% when it was between 500% to 700%; was roughly 9% when between 300% to 500% and was about 1% when between 0% to 300%. Bank accounts on deposit at other banks are known as ''due from bank deposits'' or ''correspondent bank balances." Such deposits are used to facilitate the transfer of funds and are part of the daily activities of every bank. PCBB is a correspondent bank that is owned by community banks. A Deloitte report on middle market company perspectives finds employees are starting to move around some. They report the number of employees choosing to leave their company to take jobs elsewhere over the past 12 months was: no increase (36%); slight increase (27%); moderate increase (21%); large increase (15%); not sure (2%). Under Regulation D, banks must keep reserves equal to a specified percentage of their deposits with the Federal Reserve. The deposits are maintained in the form of vault cash or deposits. The reserves are the way the Fed controls the nation's money supply.